You fine readers may recall that back in November of last year, I ran a series of interviews and concepts from Jesse Alkire (Part I is here and Part II is here). Those featured uniform concepts for all 32 teams. Last weekend, I ran Part III of that series, in which Jesse added looks at the helmets, backs of the uniforms and pants to the mix. The first 16 of the NFL’s 32 teams were shown (alphabetically by city) — and today we’ll complete the set. Team uniforms in the NFL are, generally speaking, cluttered. Two, sometimes three distinct striping patterns appear on a single uniform. Color palettes are often inconsistent. Poor design, by modern standards, is considered hallowed and classic simply because of age and heritage. I set out to give every NFL team a more cohesive, simplified uniform set. Factors such as history, uniqueness, and brand integration helped to decide which particular uniform elements were ownable for each team and how that could help give them their own distinct look and feel. • A nice clean, consistent uniform remains virtually untouched. • White socks give the home uniform the complete “white-out” look, one of the better uniform trends in recent memory. • Aqua pants an option on the road to achieve the classic white/color look. • Modified the pants stripe to keep consistent with the vikings great new striping pattern. also added striping to the socks. • The two red, flowing stripes from the team’s primary logo become the singular striping pattern on the sleeves, pants, and socks. • A patriotic cherry red acts as a bright accent to the deep navy, in the same way orange pops so well on the Broncos and Bears uniforms. • Removed superfluous number outlines for a clean, modern look. • The helmet and numbers feature a saintly stained-glass effect that changes and reflects colors when activated by light and movement. • Extravagant custom number type takes cues from the team’s primary fleur-de-lis logo. • A solid stripe on the helmet and pants keeps consistent with the solid-color collar. • The “Northwestern Stripe”, a giants signature element, is applied to all uniforms in the set to create a consistent look throughout. • Large stripes on the helmet and pants are derivative of the large center portion of the Northwestern Stripe. • A classic from the 30’s and 40’s, an all red jersey returns as an alternate option at home. • Another strong, modern take on a traditional uniform remains virtually untouched. • A modified logo once relegated to alternate status becomes the primary logo featured on the helmet. The singular green shoulder stripe is applied to the helmet, as well. • The Jets signature sleeve and shoulder striping is replicated on the socks. • Another strong, proud uniform tradition remains virtually untouched. • Solid-color socks give one of the NFL’s most traditional uniforms a slick, modern feel. • Alternate “Black Hole” uniform an option for marquee matchups, such as playoff games or rivalry games. • A lighter, more nimble look for the Eagles leaves behind the often clunky and heavy mix of dark green and black. • Silver shoulders feature stitching representative of wings. • An aerodynamic custom letter and number type, with strong edges and points reminiscent of an eagle’s tapered feathers. • The Steelers’ distinctive striping pattern is added to the socks and pants, reinforcing their most ownable uniform element. • Alternate “Steelworks” uniform an option for marquee matchups, such as playoff games or rivalry games. • Superfluous outlines are removed for a clean, modern look. And following the lead of teams in warmer climates, the road whites become the home set. • Classic looks return as the bolts are moved back on to the shoulders and gold pants become an option at home or on the road. • A white matte helmet is combined with a glossy, reflective lightning bolt which changes shade when activated by light and movement. Flashy golden shoes also add to the electric aesthetic created when players are in motion. • One of the league’s best uniform sets is streamlined for a traditional look with a small flourish of modern design. • The team’s signature sleeve stripes are moved higher on the sleeve so all three are visible. • Horizontal pant stripes add modern flare to a historic look, keeps consistent with one striping pattern throughout. • A few small changes streamline a very modern and distinctive uniform for the Seahawks. • The garish stripe across the upper chest is removed and the sleeves now feature a feather icon that is used in a consistent manner throughout the entire set. • The new sublimated feather pattern, previously only used on the helmet and numbers, is now added to the pants and sleeves. • A modified version of what many fans would say was their best look, navy adds a modern twist to one of the NFL’s most classic uniform sets. • A bold custom number type with a strong base and hard edges, reminiscent of the mountains that a ram would call home. • Solid-color socks and navy shoes gives this traditional uniform a slick, modern feel. • An all-white home set for another of the NFL’s warm climate teams, with alternate pewter pants to pair with either the white or crimson jersey. • The collar and pants feature stripes which are suggestive of a pirate’s blade. • A swashbuckling custom number type that also takes its cues from a sword. • A surprisingly consistent and modern look remains virtually untouched. • The contrasting belt loops and thick helmet stripe are meant to be derivative of the heavy shoulder stripe. • Three pairs of pants and jerseys could be interchanged for a very pleasing look in any combination. • A Nike Pro Combat-style reimagining, war paint uniforms inspired by brave indian warriors. • War paint stripes are featured on the helmet, sleeves, and pants, as well as a paint-inspired letter type. • A custom number type takes its paint-splattered cues from the feathers in the team’s primary logo. • Alternate “Black Out” uniform an option for marquee matchups, such as playoff games or rivalry games. And there you have it ”” the second 16 redesigned teams, by Jesse Alkire. Readers? How great are these? Make sure you express your thoughts (good, bad or indifferent) down in the comments section below. OK? OK! Every Sunday, we’ll have news and updates on the design contest being sponsored by Ross Clites. If you missed the introductory post on this, please click here. Last weekend, we introduced Part V which is the second article here. You can also visit the Lewis & Clark homepage for more information and updates. Yesterday we revealed the third set of concepts for the “Explorers” (you can still submit for the Governors [deadline 3/19]) and Lookouts [deadline 3/26]). And today, we’ll reveal the sixth team for concepting. If you missed yesterday’s post, which revealed the readers submissions for the “Explorers,” you can vote for your favorite concepts (you may vote for up to three). Link here. Up next for the LCBL is the Navigators of the Clark Conference. It brings us a change of pace in its exclusive lower case wordmark. This is also a special opportunity for me to recognize someone very dear to me. Back when this league was in the bar napkin conceptual phase, I was given the task of pairing color schemes for future teams. I sat on the couch in my apartment with my beautiful girlfriend Kellie and flipped to the back pages of the Rawlings catalog. She eagerly wanted to be a part of the process. Together we went through each nickname and what hues fit the best. As we settled upon the first eleven, the Navigators became the problem child. If you ever try a design exercise of creating twelve teams from scratch you will find out how unexpectedly difficult the colorization process is. The ‘Gators switched from black/silver to green/orange and everywhere in between. You see, I did not want to overlap MLB teams (or copy certain obvious college palettes) as much as I could help it. But Kellie stepped up as my voice of reason on this one. She felt that something as nautical as the Navigators needed a blue water (Mariners) feel. So on this day I want to give a shout out to my favorite teammate. Words cannot express how cool it is to find a girl that does more than support your quirky passions (that result in no paycheck) but jumps in headfirst to assist. I love her so much for wanting to learn more about what I care about. She could easily let me be as I tool around on my laptop, but it is so much better that she “bothers” me. It sure beats working long hours in cubicles across town; never really sharing any parts of our jobs with each other. Kellie — and commissioner Nicholas Mahrt’s wife Kacey — are both the best things that ever happened to this league. Guys can take the dream of talking baseball all day long and run the business right into the ground. These ladies are our navigators. I hope you enjoy this installment of the project. So far the proposals and reception have blown us away. Thanks again. To all that entered the contest for the Diplomats of the LCBL, thank you for your thoughtful presentations. Big thanks to all the readers that cast votes. It made it easier for us (the league execs) to choose what we want; choosing the best out of two is more our speed. Bill Smith and Bryan Phillips finished at the top in a very competitive, very impressive field of candidates. The league decided to go in Bill’s direction. We have worked back-and-forth with the secondary logo and its implementation of peace medal iconography. The uniform will remain a mystery until a final reveal of all twelve at the end. But we wanted to give Uni Watch Nation a taste of the winning identity. Thanks again to all who participated. We hope to have Bill out to our All-Star Game at Busch Stadium (July 3, with all y’all invited) adorned in his own hat and jersey. Today I was trying to think of some unique mascot ideas for football teams and decided to whip something together to celebrate my favorite animal, the Blue Footed Booby. They’re very unique and live on the Galapagos Islands, and I thought they could be a fun mascot for my new fantasy team, the “Bluefoots.” Hope you enjoy! Another Concept! This time for the Jets! The Bears have easily the best uniforms in the NFL. Great color combination and great old school look that does a great job of using orange as an accent color. While I do enjoy the “Monsters of the Midway” throwback uniforms I don’t like how they wear them at home because we only get to see their real home uniforms 6 times and their away uniforms 8 times. Their original uniforms are easily the best in the league so it’s a shame. I don’t know the rules, but can’t the Bears wear an alternate uniform on the road? I know the Seahawks just mix and mash anything. If so I enjoy the white pants and white jerseys they used to sport, but the dark helmets seem out of place. I made a mock up with a white helmet and at first I didn’t like it, but the next day I thought it looked pretty cool. They do look a lot like Auburn though. I decided to see what they would look like with all white and just navy? Well now they look a lot like Penn State. Not the worst thing, but pretty bland for an alternate jersey. Maybe just white and orange? Boom. I think this looks fantastic for an alternate that they wear once a year. Here’s a look at the Binghamton Senators St. Paddy’s Day sweaters (thanks to Jamie Owens). … In wake of the release of the Buccaneers’ enlarged helmet logos, Kathan Thomas sent some other examples. Lacrosse has been a testing round for uni-related for many years now: MLL Denver Outlaws; MLL Chesapeake Bayhawks; D1 Johns Hopkins Bluejays. According to Kathan, “There are many more examples on the headwrapz and insidelacrosse.gear websites, just thought I’d send a few of my favorites.” … Awesome find from Andrew Wooley: A 1976 Pirates pillbox cap without stripes (has anyone ever seen that before?). … The Albany Great Danes wore some crazy two-toned pants yesterday. Apparently, this design (thanks @Micah) is not unique (thanks Chris Lee). 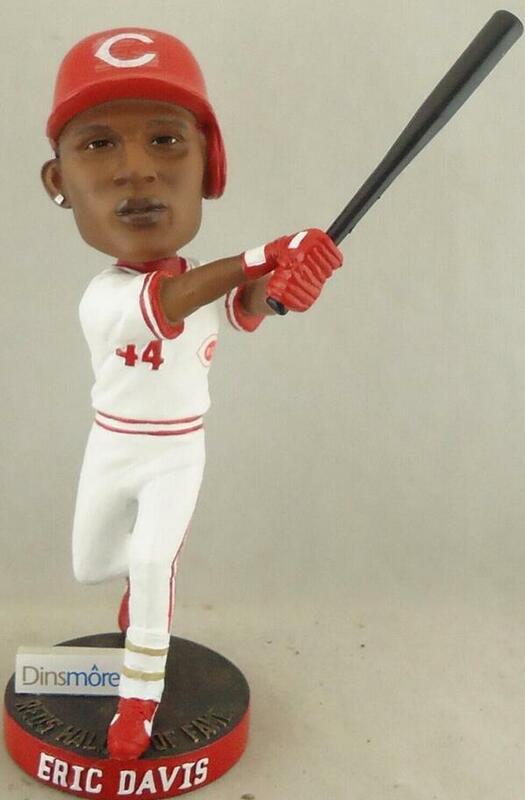 … The Eric Davis bobble head is a Reds Hall of Fame giveaway and not a Reds stadium giveaway (thanks to Dennis Hasty), who notes they’ll also be giving away Jim O’Toole and Sparky Anderson bobbles to season ticket holders as well. … Marty B. is at Spring Training and “I was excited to see the Braves now have direct sewn NOBs! Not sure if that’s been mentioned yet, but figured I’d send it along anyway.” … Via @The_Real_Cub, here’s a look at the jersey the Angels will wear on St. Paddy’s Day (I like this better than the green ones myself). … For those of you (all three) who care about tennis (besides Brinke & me), there is some pretty cool technology coming — kinda like those “ESPN Axis” (or whatever they’re called) views. … Remember that OKC NFL uniform design contest? Well, they’ve hit the deadline and now they’re putting the designs to a vote (from Justin C. Cliburn). 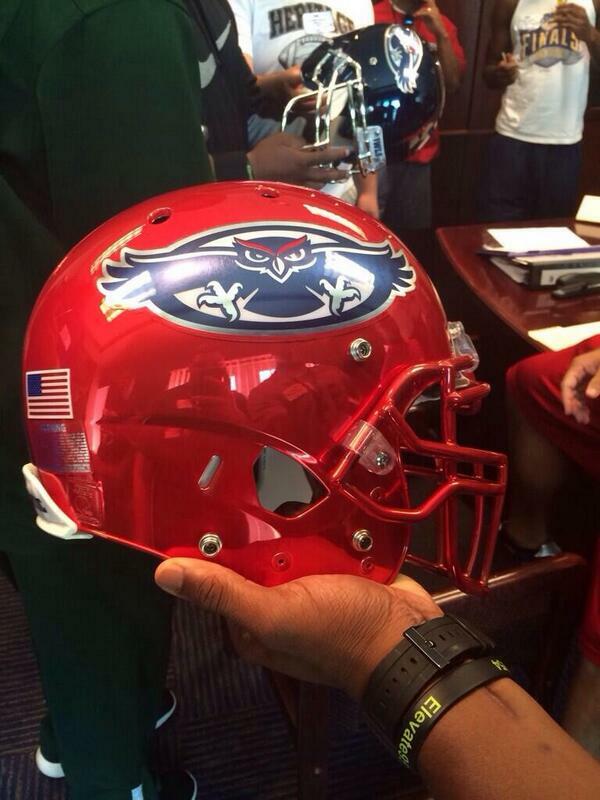 … FAU has some shiny new helmets in red and blue for the coming season. … Bryan Justman was watching Saturday’s Chelsea vs Aston villa match and “noticed that Chelsea’s Eden Hazard must cut the feet off his official socks and pull the tube over a pair of sani (if you will) socks.” Bryan adds, “I’m too emotionally invested in watching to speculate any further.” … Nice New York Times piece on the evolution of WuShock, Wichita State’s mascot (also sent in by Jeremy Baker). … Leo Strawn, Jr. reporting: Opening round in AFL is played over two weekends, but already 2 of the first 3 matches have featured color v. color (or, should that be colour v. colour? ), as Greater Western Sydney Giants knocked off rival Sydney Swans (not far from where the Dodgers and Diamondbacks will open the MLB season next week), while Gold Coast Suns def. 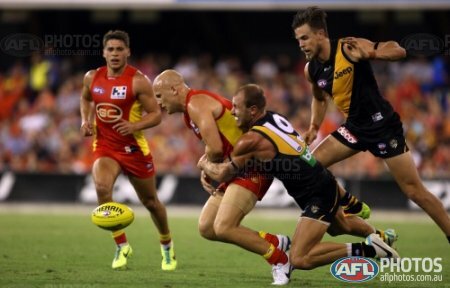 Richmond Tigers on the Gold Coast. … The Tennessee Volunteers wore their smokey gray unis and lost to Florida yesterday. For those keeping score at home, UT is 0-3 in smokey gray (Football 0-2, Hoops 0-1). … Will Moore notes there was a Grantland.com article about t-shirt jerseys or “shirseys”. … The NY Icelanders warmed up in St. Paddy’s Day jerseys last evening. 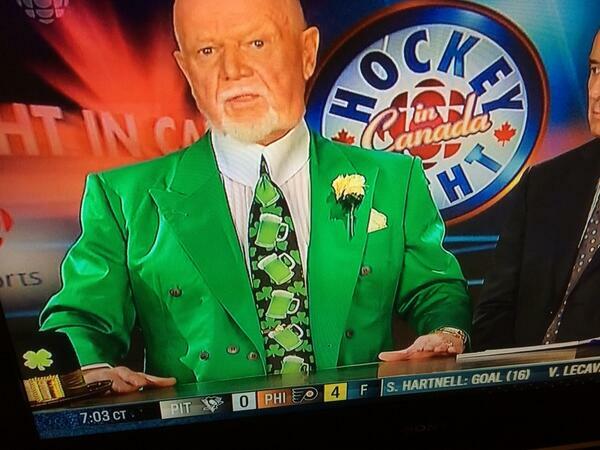 … You didn’t think Don Cherry would forget St. Paddy’s Day, did you? 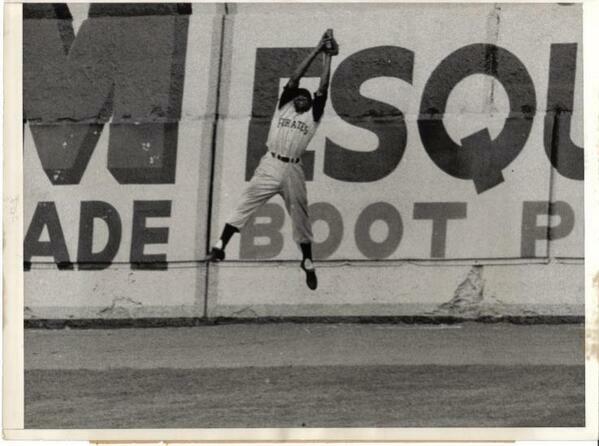 … And how about this beautiful catch by Roberto Clemente (via John Thorn). 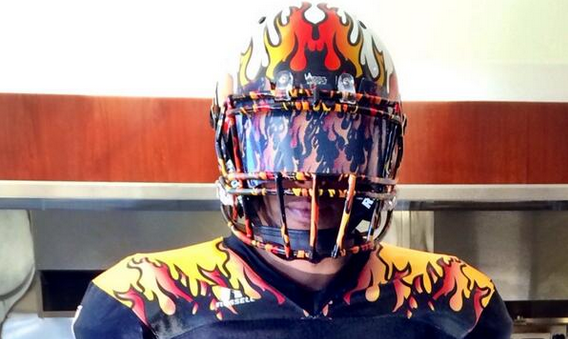 … The LA Kiss played (pic via Cork Gaines), but without the flame helmets. According to a source, the flame helmets are for home games. Also, (via Cork), the Kiss have some serious quality control issues. … If you want to have a custom Travis d”Arnaud jersey, you can’t get either a replica or an authentic (even though that’s how he spells it, and I’m pretty sure Majestic fixed the “upside-down P” issue). Pics via @STLMetsFan5. 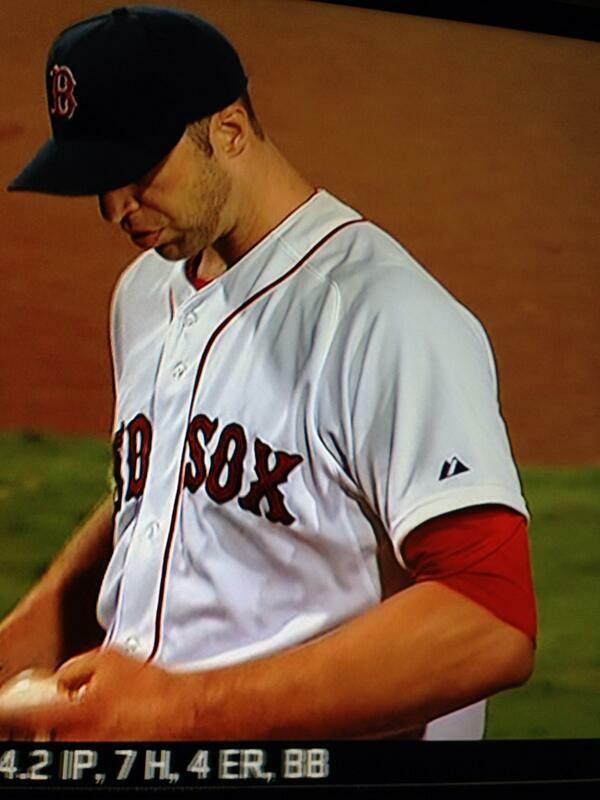 … Speaking of Majestic, Chris Capuano is still wearing the old on field jersey, if you look at the sleeve logo (h/t Nick Schiavo). … Think we’ve had this before, but Austin Glover noticed that a player on a Norwegian hockey team had a golden helmet, but the rest of the team had blue helmets. “After research I discovered that the star player or points leader gets to wear the Golden Helmet, or “GuldhjÃ¤lmen“. Imagine something similar in American sports!” … Joseph Hiley noticed the Big East floor has that same phony perspective trick as the Raptors. … There is just so much wrong with this (let’s count the ways). That’s all for today folks. Big huge kudos to Jesse for those amazing concepts, to Ross for the next phase of the Lewis & Clark contest, and of course to the uni concepters. Great stuff all. Everyone have a great week and I’ll catch you next weekend. Man, those Philadelphia Eagles Uniforms look awesome! Great Job. Got the colors right, but not the design. The Eagles are not the Oregon Ducks love child. indeed! i’d go with an update of the 1960 unis. I hope you meant 1980. The 1960 uniform doesn’t have anywhere near enough silver in it (just the wing on the helmet) and any update of that uniform would just make them look like the 80’s Jets. We’ve seen the unstriped Pirate pillbox caps before, in spring training photos. I haven’t seen an explanation. And today’s Penguin warmups, as tweeted by Dana Heinze. I have the possible explanation for the unstriped Pirate pillbox caps in spring training of 1976. These photos were used in the 1976 team yearbooks,which were sold on opening day(like all MLB clubs). It seems team officials didn’t like the bland appearance of those stripe-less caps, and ordered the change sometime after spring training, and before the start of the regular season. It’s possible the change was made before the end of spring training, and the Pirates may have worn the striped caps for a few games before heading north. Looking back, the stripes were badly needed, and whoever made the call made the smart decision. It’s interesting to note, unlike the Cardinals, the Bucs did not employ striped batting helmets for 1976(or beyond). One would have assumed otherwise, considering the attachment to the pinstriped caps for nearly a decade. The other aspect of this topic was if the Pirates were inspired to add the striping from caps of the distant past, or if teams like the Cardinals and other NL club who wore the pillbox caps were wearing that style in spring training of 1976, and the Bucs followed suit and changed direction. My final thought would be the Pirates may have been offered the striped cap version initially, opted for the blank style, then reversed course, when they saw how empty the cap looked afterwards. The 1976 NL pillbox hat phase would be an interesting topic for this blog. Who came up with the idea, and how many teams were involved, and to what extent. You can scroll down on this page to see a color shot of the Pirates’ stripeless pillbox style. Also a bunch of other pillbox style hats, game used and fashion. I used to own A’s and Giants pillbox style hats. That Padres pillbox hat is very unusual, have to wonder if they only wore it once in 1976. Brown top, yellow middle, and brown bill on that San Diego hat. So is the Chargers lightning bolt. Stlll think that Ryan Foose had a better logo for the design contest. Maybe, maybe not. That is why I love the process of voting. He wasn’t in the top two. I like that it won’t be the LCBL brought to you exclusively by Ryan Foose. There is no doubt he will win again, but nice to see a change of pace. If he kept winning all the time people would get disenfranchised with participating (both on the proposal end and the voter turnout). Thanks for sharing your opinion. Any conversation about the league is a win for us. Those Giants uniforms are awesome, but I think I prefer Jesse’s original number don’t for the Saints. Well, the Bucs concept is better than what the team came up with, and the 49ers amuses me since the pants have a Nike swoosh next to what look like Adidas stripes. The Eagles look like an Oregon Ducks ripoff and the Steelers sleeve striping on yellow pants looks ridiculous. Put ’em in mono-black if you’re going to do that. And the Raiders don’t need black helmets, ever. Black pants specifically to wear with a silver jersey, maybe, but no helmet. No doubt the Eagles/Ducks similarities are intentional, given Chip Kelly’s past and current positions. Given today’s marketing/branding crossovers I could easily see something like this happening. The black helmet is interesting. Since the league won’t allow a second helmet (?) it’s a moot point. However, I wouldn’t mind seeing if you had reversed the colors logo on the helmet as well. Can we get a side-view of the black helmeted Raiders? Also, the Rams’ helmet look great from the front, but from the side, the bigger horn make the helmet look it it’s yellow. Happy St. Urho’s Day. Be sure to wear your grewn and purple. No doubt Paul’s favorite holiday. 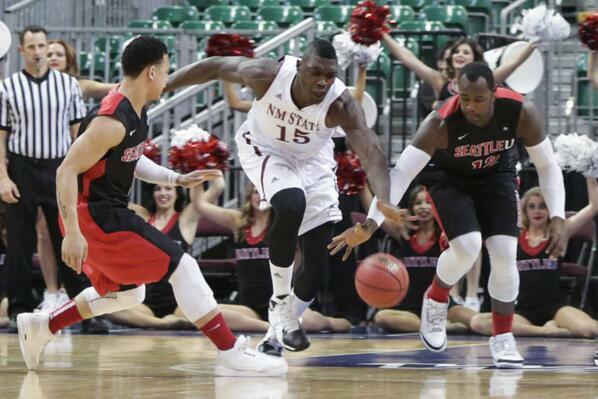 Any ideas why there are 3 uniforms on the court in the Albany Great Dane pic? 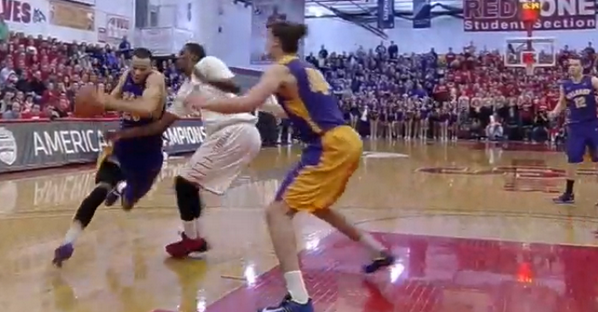 Looks to be a guy in white guarding a guy in black, and two purple/gold guys…I think I’m see that correctly. An all-white — including helmet — Bears uniform? Sorry, but no. The designer should’ve stuck with his first impression. First impression of that Eagles image at the top- Eastern Michigan. Although it’s Oregon-esque, that’s a great upgrade for the Eagles. I like the Giants red alt, but prefer red numbers on the white jersey. Soccer players cutting the feet off their socks is a trend that’s been going on for a couple of years. Some players like a tighter, thinner sock to wear in their boots. That Sparky Anderson bobblehead looks all wrong. Not enough lines on his face! best of Jesse’s designs: Rams, Saints, Washington. I simply don’t get the obsession with Jesse’s work. The concepts lack creativity (that one thick pants and helmet stripe is in at least half) and he systematically strips away the identity of many of the teams. His use of color is disastrous — too many light colors on white — and many of the changes are simply change for change’s sake. The color balance is off on most of these designs. And for all the “streamlining” he completely muddles the Steelers with an overly complicated striping pattern. The embrace of these concepts shows that presentation still blinds people. I agree completely. I don’t like any of his redesigns and concur with a lot of your points. Anyone who likes those new Dolphins unis and barely touches them on a redesign simply doesn’t know what he’s doing. To each his own I guess. When you’re taking on all 32 teams as he is, I’m willing to forgive a few less-than-stellar efforts. And a lot of his simple recolorings are surprisingly pleasing to the eye. I the execution of Jesse’s uniform designs are very good, but most of the designs are not my cup of tea. Granted, I prefer old-timey, simple football unis. 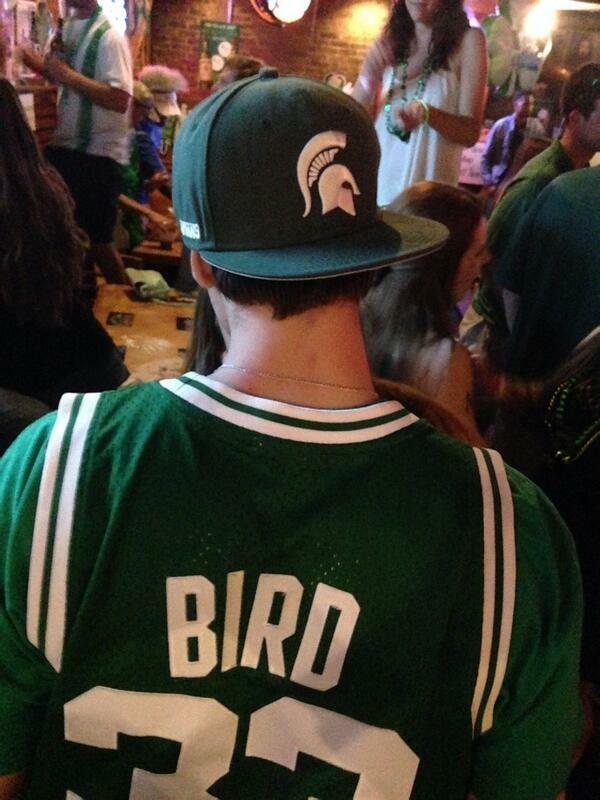 I’m a ‘Skins fan and I would be highly disappointed they ever wore a uniform like that….especially the BFBS alternate. Love the Redskin offering, particularly the helmet, and the striping on the pants. Also, I’ve long thought that the Saints could use a bit of sprucing up – very nice. Would love to see the Rams return to a white helmet, but the yellow jersey is a plus. And the Bucs looks great. Too bad they did not consult Jesse before their recent change. Not crazy about the Pats, but overall very nice job! Good eye for keeping tradition, while introducing modern elements. Please no ripoffs of the old Eastern League’s Norwich Navigators. Yes, if you put an alligator in your design, you will gain votes–it will still be a knock-off. No reptiles allowed! Yeah, I think it’s time to promote a new hashtag: #MadeInMerch. As a Washington ‘Skins fan, I think the uniform set proposed here is butchered. While I like the overall concept of the war paint, the color combos are way off. First of all, black is not, and has never been a team color. They’re not the Raiders. Second, the monochromatic burgundy look is terrible in my opinion. It was only worn one or two times during the dismal Jim Zorn era, never before, never since. I don’t want to see it again. I would like if they had shown a burgundy jersey with gold pants as the home set, a white jersey with gold or burgundy pants as the road set, and a throwback home alternate. I like a lot in Jesse’s designs, but there are a few misfires as well. I think the things I like the most are a general leaning towards simplicity yet team distinctiveness; a preference for brighter colors (Eagles, Rams, Chargers in this batch); distinctive shoulder patterns on most of the unis (notwithstanding that I really don’t like the Eagles’ Duck-shoulders in this batch); and also making the socks a consistent part of the uniform. NFL players currently wear such a mishmash of sock looks. Horrible misfires include some truly bizarre adjustments to the pants striping (49ers/Bears sideways stripes on the hip look awful; Bucs/Texans strange curvy shapes don’t look good either; and the truly strange attempt to lay yellow stripes onto the Steelers’ yellow pants may be the worst of the bunch). On the whole I’d take most of these, though. All 32 teams included, there are only a handful of designs I’d want to outright veto, if I were in charge and these were up for serious consideration. In the Arsenal/Spurs game today, Alex Oxlade-Chamberlain lost his boot and because it is so tight, he had trouble putting it back on when it came off during the match, because his sock was all scrunched up. No mention of the GIANT TV numbers? or the removal of helmet stripe? or the colored helmet numbers? or the removal of chest patch? How is it that it takes the best talent Nike (or Adidas or anyone else) a year and a half to come up with the new Tampa Bay Bucs set, and one guy working on his laptop managed to create 32 superior designs in a fraction of the time? One question for Jesse, though: is there a point when the messiness, the quirkiness, is exactly what makes the uniform work? Think about the black nameplates on the Flyers sweaters: I hate the Flyers, but those mismatched nameplates are one of my favorite things in sports. There are a lot of examples like that. Does making clean and coherent design the main priority rob teams of identity, at least in some cases? Also, and on another subject: if you’re going to give a club a cutesy wordmark, dress them in a color that’s spitting distance from purple and call them the Navigators, you can’t be surprised if you end up with some alligators in the designs. Because the guy doing designs in his free time doesn’t have to work with anyone else. It’s easy to design for yourself, it’s much harder when multiple people all have creative input. To add to what The Jeff said, not only are you designing for yourself, you don’t have the input of what team management wants. With that said, I don’t like a lot of these design concepts, so the answer to your question simply remains in the eyes of the beholder – one man’s trash is another man’s treasure. I had another also, but I forgot what it is. Every one of Jesse Alkire’s designs are GODAWFUL. 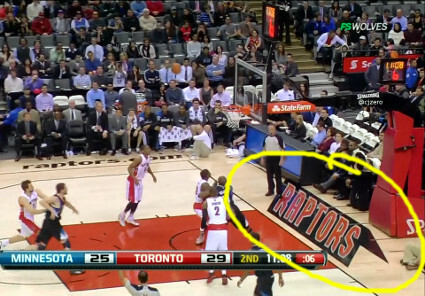 Nice effort by Jesse but all the uniforms look the same. Same computer design template = same uniforms = boring redundancy. Although I consider myself a traditionalist, and would ordinarily balk at any modern designs or changes…I love all of Jesse’s designs. He really does a great job of incorporating the traditional, and blending it with the modern. Kudos. My favorite is the Rams. I loved those uniforms they wore through the late ’70’ and into the ’80s. It would be fun to see that color scheme again, and those horns on the sleeves!